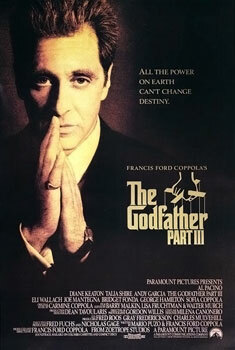 The third part in The Godfather Trilogy, this film sees an aging Michael Corleone (Al Pacino) still trying to take his business straight. How? By going into business with the Vatican. Because that makes sense. I’ve heard it said that many consider this to be the weakest of the films, yet I think it is still considered to be a good film. I dunno… I found that in the previous films, I quite liked Michael and hoped that he would come good. In this film, I felt he was too far gone – he was just so over the top, quite a caricature of who he’d been previously. And the whole Vatican story I found… quite stupid, really. I just couldn’t care less. Perhaps it was just too much Godfather in one weekend.